Few corporate executives have provided as powerful a role model as James E. Burke, former CEO and Chairman of Johnson & Johnson. He worked at J&J for 40 years and died on September 28, 2012 at the age of 87. We will miss his presence, showing us the way, and encouraging us to be better than we thought we could be. Jim Burke’s leadership produced an extraordinary company. During Burke’s tenure as CEO and Chairman, J&J’s revenue and market capitalization tripled, and its profits quintupled. His crisis management during the famous Tylenol recall, and his performance as a genuine steward of the J&J “Credo” demonstrated his commitment to ethical behavior. The J&J Credo puts the firm’s first responsibility to the doctors, nurses, and patients who use their products. Following them come the employees, the communities in which employees live and work, and finally their shareholders–a powerful statement of proper stakeholder responsibilities. Fortune named Burke as one of the ten greatest CEOs of all time. Jim Burke was not only an extraordinary businessman and corporate leader; he also represented all that we would expect of a patriot and citizen. He was a World War II sailor and graduate of Holy Cross College and Harvard Business School. Burke served on the board of IBM and was instrumental in persuading his fellow board members to recruit a new CEO and in finally persuading Lou Gerstner to join the firm and lead its turnaround. Gerstner’s leadership was also legendary. Burke served as the Chairman of the Partnership for a Drug-Free America for thirteen years and was awarded the Presidential Medal of Freedom by President Clinton in 2000. Unfortunately, J&J lost its way in the 2000s, encountering numerous product recalls, takeovers or closures of plants by U.S. regulators, thousands of lawsuits filed, and multi-million dollar fines. This past spring, J&J replaced its CEO, William Weldon, and brought in Alex Gorsky. We can only hope that Mr. Gorsky embraces the culture of character that is the heritage Jim Burke left at J&J. Reinstalling the Credo to its rightful place at this venerable firm would be the best tribute to Jim Burke’s impressive and admirable legacy. Dr. Sweeney is the director of the Institute for Enterprise Ethics at the University of Denver. Visit http://www.enterpriseethics.org. 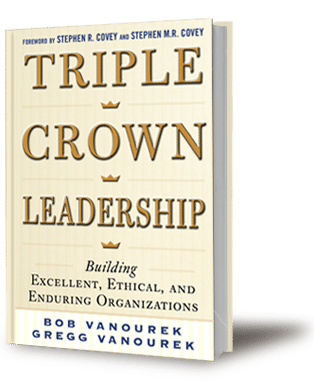 Bob and Gregg Vanourek are the authors of Triple Crown Leadership: Building Excellent, Ethical, and Enduring Organizations. Visit www.triplecrownleadership.com.